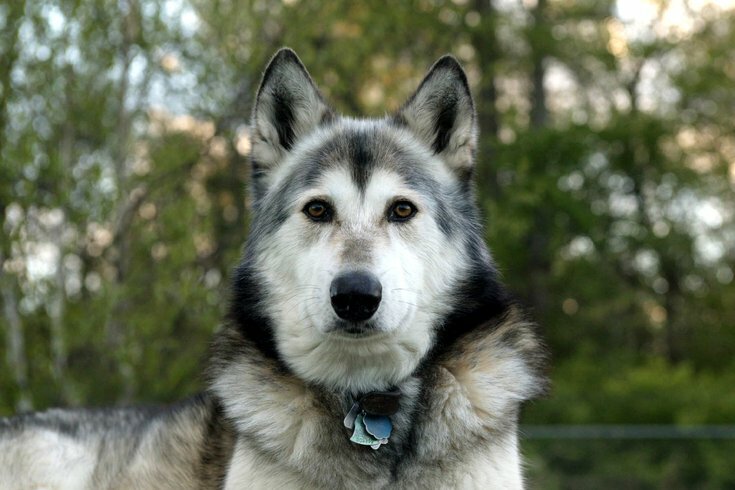 Cliff Zager owns 12 wolf-dog hybrids, like the one pictured here in Indiana, and two standard dogs at his Holland Township, N.J. home. A man is raising a pack of 12 wolf-dog hybrids, along with two standard dogs, in his New Jersey home, NJ.com reports. Cliff Zager and his 14 dogs live on his nine-acre property in Holland Township, Hunterdon County. Zager, who has no wife or children, refers to his pets as his "non-human family." That's why when one or more of them gets loose, which happens often, he worries and works to better secure the yard. "They have to do their exploring, then it's time to come back to the pack," he told NJ.com. "They can get into squabbles, but they have a very strong sense of family." Fortunately, it's instinctual for them to return to the pack, he said. A quick repair, while keeping the rest of the pack inside the fence, prevents the escapees from returning to their Spring Garden Road home. He relies on that pack to alert him to the return of loose pets. Zager said he understands the concern of his neighbors who fear the dogs' escape. "I'm worried about my family and they're worried about their families," he told NJ.com. "I'm not uncaring, I'm just trying to take care of my situation." Sandra L. Piovesan, of Salem, Pa., bled to death in 2006 after being mauled by a pack of nine wolf-dogs that she had raised as pets. Mayor Ray Krov told NJ.com that the township hadn't received any reports of problems caused by the loose wolf-dogs. In 2009, neighbors' complaints of a dead cat and dogs on the loose led a proposal to ban wolf-dogs in the township, but it never passed.